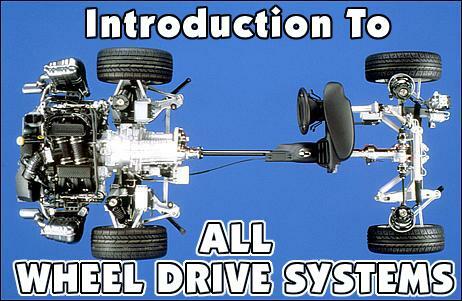 Every damn' thing you ever possibly wanted to know about high performance four wheel drive systems! This article was originally written in the fall of 1992. Back then - as now - there was a general lack of good information regarding all wheel drive vehicles and how they differ from traditional four wheel drive vehicles. I have now updated that original article to cover current vehicles, and this article has been very well received by the Internet community. It is important to get the definitions down first, since for any four wheeled vehicle, all wheel drive and four wheel drive mean literally the same thing. Generally speaking "all wheel drive" implies permanently engaged or automatically engaging four wheel drive and "four wheel drive" implies manually engaging, part time four wheel drive. The auto industry usually abide by these definitions but not in all cases. The now departed "all wheel drive" Ford Tempo and Subaru Justy were really part time manually engaging systems, like the older Subaru GLs. The term on demand four wheel drive is quite ambiguous. It can either mean that it is a part time manually engaging system or a part time automatically engaging system! The automotive media shares a lot of the responsibility for the confusion. Factual errors are common, so is the careless use of the various terms interchangeably. For this article I shall be using the terms loosely and will be more specific where necessary. 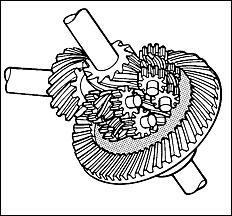 A differential is a mechanical set of gears which takes input torque from a driveshaft and splits it evenly to two output axles, allowing them to rotate at different speeds. A differential in a front wheel drive or rear wheel drive car allows both wheels to apply power to the road and yet be able to rotate at different speeds so that the car can turn without resistance. A permanently engaged four wheel drive system needs to have three differentials to enable it to apply power to four wheels and be able to turn without resistance: The front, rear and centre diffs. (diff = short for differential) This is because the distance travelled by the turning front wheels is not the same as the distance travelled by the non-articulating rear wheels. Power leaving the gearbox first goes to the centre diff, which then splits it via the driveshafts to the front and rear diffs. Manually engaging part time four wheel drive systems in most cases do not have a centre diff, so they cannot be used in the dry. When four wheel drive is engaged in such a system, the front and rear axles are locked together and will rotate at exactly the same speeds. The difference in front and rear wheel speeds has to be scrubbed off by the tyres. This is a core design issue in all wheel drive technology because these have a profound effect on the cars' road behaviour. Consider the case of the simplest all wheel drive car with three "free" diffs. The car can be rendered immobile if any one of the four wheels loses traction because basic differentials equalize the torque output. A simplistic way to look at this is to think that the basic "free" differential sends power to the axle with the least grip, so if one wheel loses grip, all the power is sent there, leaving nothing for the remaining three. In reality, the differentials are equalizing the power distribution, so everything is equalized to zero in this case. Remember that a four wheel drive vehicle has twice as many wheels as a two wheel drive to lose grip and mobility on. And since four wheel drive vehicles tend to be used more in bad conditions, it is quite important to have some form of differential locking. Every full-time four wheel drive car on the market today has some form of diff locking. A good way to understand this concept is to trace the evolution of the very early systems to the state of the art. Audi was the first manufacturer to successfully sell high-performance, permanent four wheel drive with the pictured Quattro, released in Europe in 1981 and in the US in 1983. (The car goes by the more popular name turbo quattro coupe in the US and more recently, the Ur Quattro around the world). The cars were very successful in rallying, winning several world titles and setting the automotive world ablaze - four wheel drive was never previously associated with ultra high performance. Even though the 1966 Jensen FF was the first vehicle to have full time four wheel drive (and also anti lock brakes) the car was a commercial failure and it was left to Audi to break through the public consciousness and go into the history books for launching the full time four wheel drive revolution. 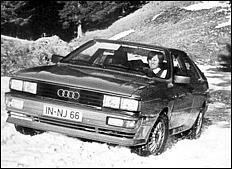 During the 1980s Audi decided to spin off four wheel drive and the quattro name to its entire range of cars. The first generation quattros had simple locks for the centre and rear diffs, which locked one or both of them solid (no speed difference) to dig one out of deep trouble. When the centre diff was locked, it meant that one had to lose grip on one rear and one front wheel to become immobile. When both the centre and rear diffs were locked, one had to lose both rear wheels and one front wheel to get stuck. The locks on these Audis were manually engaged and were quite cumbersome since the driver already had to worry about shifting and steering in addition to this. Audi found that many drivers forgot to disengage the locks once they got going again. Thus development went in the direction of automatically locking differentials. 1. Some manufacturers used regular differentials in conjunction with the VC where the VC functioned as a diff lock that acted automatically when conditions needed it. The current Mitsubishi Eclipse GSX and current manual transmission all wheel drive Subarus use this scheme. 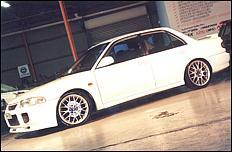 The departed BMW 325ix and Toyota Celica turbo All-Trac (GT4) also used it. 2. Audi, during the development of the original quattro, also played with VCs and came up with a completely different way of using a VC. In this implementation, the VC is used as the centre diff, resulting in a part-time, automatically engaging four wheel drive system. In this implementation, the car is basically front wheel drive, with the rear wheels coasting along and minor speed differences absorbed by the VC when the vehicle was turning. When front wheelspin occurred, the speed difference would increase to the point where the VC with its viscous liquid churning would start transferring some of the torque from the front to the rear wheels and thus the vehicle would become four wheel drive. Note the difference between this system and the former. The latter is auto-engaging part time four wheel drive, while the former is full-time auto-diff-locking four wheel drive. The part time automatically engaging system was never put into production by Audi but was instead spun off to VW, which did put it to market as the Syncro system. The simplicity of this implementation has drawn a very wide range of manufacturers to use it as well, from all the minivan implementations, many of the newer SUVs to exotics like the current Porsche 911 turbo and Carrera 4 and the Lamborghini Diablo VT (these have permanent drive on the rear wheels, of course). Volvo is a new player in this field and its latest all wheel drive offerings also use this scheme, with an unusual cocktail of limited slip devices thrown in, namely a traction control system at the front and a regular mechanical limited diff in the rear. Several magazines have found this system to be in need of further refinement. Next came the Torsen (stands for TORque SENsing) differential, which was embraced by Audi in its second generation quattro system. Audi was approached by FF development (owners of the VC patent) during development of the original quattro back in the late 1970's but the VC was rejected for reasons that will become clear shortly. The Torsen diff was invented by an American company (Gleason Corp) and had all the advantages of the VC and none of its disadvantages. It is a fully mechanical device of worm gears and a worm wheel whose workings are quite difficult to describe with words and probably beyond the scope of this article. However, the Torsen's characteristics are the issue that is of interest here. More importantly, the Torsen does not lock or inhibit speed differences under braking, thus allowing all 4 wheels to rotate independently at their own speeds when no power is applied. The Torsen diff only locks in a power application situation while the VC locks both during acceleration and braking. The Torsen has a torque sensing characteristic while the VC has a rotational (ie speed difference) sensing characteristic. The VC's rotational sensing characteristic initially caused lots of problems for the engineers. Anti-lock braking systems rely almost entirely on speed differences between the 4 wheels to detect a locking wheel. Thus, when the transmission tries to force 4 wheels to rotate at the same speed, it creates serious difficulties for the ABS system. The engineers had to use a variety of hacks to get around this problem. Mitsubishi delayed ABS for a while for its first generation GSX, then finally decided to make ABS and rear VC limited slip mutually exclusive options. The VW Syncro system simply disconnected four wheel drive the moment the brake pedal was stepped on via a secondary clutch. Most other vehicles using this implementation of VC have a very similar disengage feature. The very successful World Rally Championship Lancia Delta Integrale even went as far as to apply a little bit of power (via the engine computer) to reduce the drag of the VC when the brakes were applied! Some very crude systems used a overrun device that is conceptually similar to the bicycle crank. This meant that while four wheel drive was disengaged during braking it was also inoperative when reverse was engaged! The easiest hack was to reduce the effective viscosity of the fluid in the coupling, so that the drag was reduced. This also meant that the VC's locking effectiveness was reduced, which is probably quite acceptable for a vehicle intended primarily for paved roads. The VC's attraction is its simplicity and cheapness, not its sophistication. In the late 1980s Porsche and Mercedes were treading slowly and came out with all wheel drive vehicles of unparalleled complexity. Mercedes' 4Matic system used the ABS sensors to determine wheelspin. In the dry, the Benz was a rear wheel drive car. When the wheel sensors determined that the rear wheels were spinning, a signal was sent to the computer to start engaging a hydraulically actuated multi plate clutch to send power to the front wheels. Clutch engagement was progressively altered by the computer. When the computer determined that even more traction was needed, a second clutch would start locking the rear diff. When the brake pedal was pushed, both clutches disengaged instantly to allow ABS to work without interference. The Mercedes 4Matic was a part time, automatically engaging four wheel drive system. The reason given by Mercedes why they went to great pains to design a part-time four wheel drive was that they did not want to upset their loyal clientele with a full-time four wheel drive, which because of the driven front wheels, would "change the traditional feel of a Mercedes". One could also speculate that they were too proud to use anything less complicated than Audi, which in the marketplace is considered "lower". In practice, the 4Matic system worked no better and no worse than the other crop of full-time four wheel drives, but its cost and complexity made it look bad. This original 4Matic system has been ditched and the latest 4WD Mercedes is now a full time system, including the system to be used in the "M" class SUV. 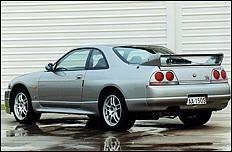 The Nissan Skyline GT-R uses a system that is conceptually similar to the original 4Matic. The 959 was followed by the 964 which was first introduced in 1989 as the 911 Carerra 4. Porsche claimed that this was an evolution of the system used in the 959 and is even more advanced. However, this was a fixed split system like all the others, with computer controlled clutches acting as limited slip devices. The 964's trump card, however was that the speed sensors and accelerometers were used with the computer controlled locking rear differential to cure the 911's natural tendency to oversteer if the throttle was suddenly lifted off in a turn. The rear diff would start locking when the computer detected that oversteer was imminent. A locked rear diff would induce understeer, which in turn countered the oversteer. Through the use of all wheel drive and smart differentials, Porsche was able to tame a formerly unruly beast into a much more docile animal. This, according to their chief engineer was their main reason for implementing all wheel drive in the 911, as the 911 with its rear biased weight distribution is not in a real need of extra traction. In 1993 Porsche updated the 911 with a brand new rear suspension. Even the rear wheel drive version was tamed and thus the justification of using a highly complex computer controlled all wheel drive system disappeared. The four wheel drive version of this 911 (alias the 993), has a much simpler, lighter and cheaper part time automatically engaging VC system such as those found in the Golf Syncro and most minivans. However, the smart rear differential that fought the deadly oversteer was retained to quell any remaining tendency to oversteer. The new watercooled 911 (aka 996) C4 uses essentially the same system as the 993 C4, but with additional computer controlled stability assistance tweaks. It is somewhat disappointing to see that Porsche - once the clear technological leader in this field - retaining the viscous coupling in its latest AWD offering while many other new AWD offerings such as the new VW Golf 4Motion and 1999 Jeep Grand Cherokee have more sophisticated designs. Subaru deserves mention here because in the automatic version of the Legacy and Impreza (including the Outback variants), it uses a computer controlled system much like those found in the Mercedes 4Matic, automatic Audi A8/V8 and the earlier Porsches. 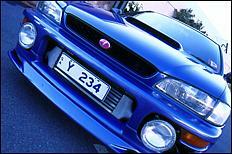 Subaru has been offering this sophisticated system for a long time in a relatively inexpensive car. Much more recently other makers have started offering conceptually similar systems. 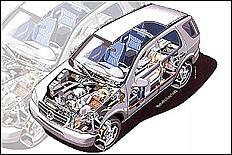 The Honda CR-V, the 1999 VW Golf 4Motion and its derivatives such as the Audi TT now use a system that is conceptually similar. The Audi A8 (as well as the automatic version of the Audi V8) also used a computer-controlled clutch to lock the centre differential, in a manner similar to the systems just described. The automatic transmission supplied a ready source of hydraulic pressure to lock a pack of clutches, so it was tapped. This system represented Audi's first successful mating of automatic transmission with quattro all wheel drive. Current quattro models with automatic transmission use a centre Torsen differential with the exception of the A8. For all its technological glitz in the 1980s, all wheel drive cars eventually turned out to be a commercial failure with the exception of the niche brands like Audi and Subaru. 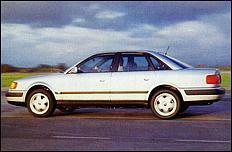 In the late 1980s there were all wheel drive offerings from every major manufacturer as it was the latest fad. Many of these manufacturers have since dropped their all wheel drive models in favour of highly profitable truck-based sport utility vehicles, or SUVs in short. For the cars a more simple and inexpensive alternative was there, waiting to be exploited. Anti-lock braking systems have speed sensors on two to four wheels to detect differences in speed between wheels so that the computer could intervene and "pump" the brake on the locking wheel. By a few simple extensions to the system, it could be made to brake a spinning wheel, thus effectively transferring power to the one with grip. More sophisticated systems would reduce engine power to further slow the wheelspin, but generally speaking, traction control is merely an optimisation of two wheel drive using ABS technology. 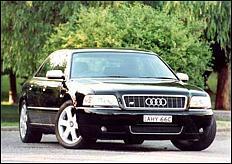 Current versions of Audi quattros (dubbed quattro IV) use all wheel drive in conjunction with 4 wheel traction control. Under no slip conditions, power is delivered 50-50 to the front and rear via a centre Torsen differential, which would take care of limiting slip between the axles. The traction control system would take care of limiting slip between each wheel of a given axle. Thus for the first time, the quattros have to lose traction on all 4 wheels before they become immobile. The prior generation of quattros had centre Torsen differentials (except A8/V8) and manually lockable rear diffs which locked it solid. This featured automatic unlock at speeds exceeding 15 mph to aid the forgetful driver. The V8 quattro had a Torsen diff in the rear and either a computer controlled clutch in the centre (for automatic transmission) or a Torsen (manual transmission). The new Mercedes ML320 (and ML430) SUV uses a relatively simple implementation of open differentials and four wheel traction control. This implementation has been criticised by several sources as being inadequate. The main disadvantage of the M class AWD implementation is that excessive demands are placed on the brakes under extreme conditions and the system can also be prone to hunting. Zexel engineers found that if a Torsen centre differential is added to this system which would act before the onset of wheelspin, TCS brake activation would be reduced by over 50%. The presence of this data suggests that Mercedes might have gone a little too far in cutting costs by eliminating limited slip or torque sensing capability in its centre differential. The subject of torque splits has been quite misunderstood. Basically, every four wheel drive vehicle with the exception of the Porsche 959 (and GT-R Skyline - Editor) has a fixed split when there is no slip. For the full time systems, 50-50 is common, but also not unusual is 60+% rear 30+% front. The latter is usually found on cars that started life as rear wheel drive vehicles, while the former on cars that were originally front wheel drive. For the part time VC systems this ratio is usually quoted as 95% front, 5% rear. Some have argued that the 5% constant rear drive would qualify it to be considered a full time system. Regardless of the merits of this argument, the fact remains that the main reason why there is a dribble of power going to the rear wheels is because a little "slip" is deliberately engineered into the driveline to keep the VC tight, so that when the front wheels spin there is little or no lag before the rear wheels start driving. The VC in this implementation always thinks that the front is slipping slightly relative to the rear even if all four wheels are running at exactly the same speed. Slightly different final drive ratios are used to achieve this. The conventional idea of slip suggests a scenario where one or more wheels are spinning when the vehicle is operated under slippery conditions. There is however an additional concept of slip to consider. Recall that the front wheels travel a greater distance compared to the rears in a turn. Thus to a limited slip device sitting on the centre differential, the front axle is "slipping" relative to the rear. The limited slip action thus directs more power to the rear in a turn. For nose heavy vehicles such as Audis, this effect reduces the amount of driving the front tyres need to do, thus allowing them to be used for increased turning power. This small dynamic optimisation in torque distribution allowed Audi to greatly reduce the terminal understeer experienced in the first generation cars. 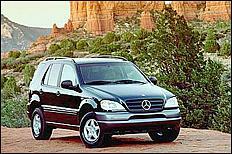 Consider the case of the Mercedes ML 320 SUV with four wheel traction control and an open centre diff. When one end loses grip completely, the system would transfer some power to the other end. Theoretically speaking, if one were to jack up the rear end of the vehicle off the ground, the system could potentially transfer 100% of the power to the front, making it a front wheel drive vehicle, and vice versa. In reality since traction control merely pumps the brakes rather than lock the spinning wheels completely, less than 100% of power can be transferred to the front. The point to note is that quoted torque splits like 37/63 only apply when there is no slip. Given the extreme example above of one axle being jacked up off the ground, a AWD system with any type of limited slip devices can theoretically go from its nominal split of say 50/50 (or whatever it may be) to 0/100 or 100/0 depending on how solidly the centre limited slip device or 4 wheel traction control system locks. Mercedes does not quote the percentage locking factor on its traction control system, so one cannot really tell what its true variations of torque splits are under extreme conditions. Part time manually engaging systems with no centre differential as well as early full time systems such as the first generation quattros with manual locks can have the variation of going between 100/0 front/rear and 0/100. These extreme variations also mean that no speed differences will be allowed between axles, which is why most modern systems never achieve 100% transfer of power. A 80% locking ratio would allow the speed differences of turning wheels to occur without interference. A system that can lock the centre diff solid would also mean that each axle will have to be engineered to be able to handle 100% of the engine's output, when in reality it would be loaded no more than 50% most of the time. 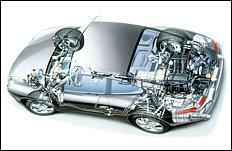 This would lead to a virtually indestructible system with a life that would far exceed the rest of the car. The downside is that the doubling of rotational masses would make the car sluggish when moving off the line, affecting automatic transmissions variants the worst because these tend to have a higher (numerically lower) 1st gear. An emerging trend in vehicle dynamics development is the use of "stability management systems", which use much of the ABS and computer controlled AWD hardware to further optimise all available grip. The more sophisticated AWD systems will re-proportion the power distribution according to available traction at each wheel, leading to a very safe and neutral feel when powering out of a turn. However these systems do not work if the driver lifts off the accelerator pedal completely in a turn. Many potential buyers of all wheel drive cars wonder if the extra "stuff" will mean more problems, or if the system will lead to heavy penalties in fuel consumption. Real world experience has shown that all wheel drive systems are not known for any kind of teething problems. The probability of an extra set of driveshafts failing has turned out to be as probable as a V8 engine failing because it has double the number of cylinders over an inline 4. This is a good analogy because with the power split over more wheels, the drivetrain is less stressed. Those implementations that rely on ABS wheel sensors to lock differentials would be as likely to suffer from problems as any car with anti lock brakes ie no greater than average. In fact, many of the suspicions of all wheel drive come from the world of manually engaging part time systems where attempts were made to make four wheel drive engagement less cumbersome, with features such as automatically locking hubs and/or "shift on the fly four wheel drive". An all wheel drive system is always engaged and is actually simpler because it eliminates the need of these convenience "features" and their associated parts, which are the usual source of problems. Accusations that four wheel drive wastes a lot of gas is only applicable to part time manually engaging systems. A full time system with a centre diff has none of the tyre scrubbing waste of the former. Furthermore, research by Audi showed that as tractive loads built up, the tyre losses of two wheel drive exceeded the losses caused by the extra weight and inertia of a full time four wheel drive system. Tyre losses were found to rise disproportionately with load. Consider the extreme case of the "burnout" or wheelspin scenario, where 100% of the tractive energy is converted to burning rubber rather than propelling the vehicle. Part time, manually engaging four wheel drive systems also make it extremely difficult to have a decent suspension set up. 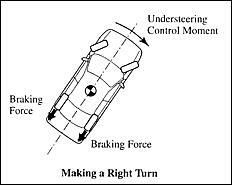 For cars with front-wheel steering the front wheels have to travel a greater distance than the rears in a turn. Because there is no centre differential, the rears would therefore have to scrub their excess speed and in doing so, lose some adhesion for cornering. With less grip in the rear, the vehicle becomes oversteery which to an average driver does not constitute safe behaviour. The result is that a lot of positive camber is applied to the front, making the front wheels resemble an upright "V". The effect is that the front wheels now have a smaller contact patch and thus less grip in a turn. Remember that all this tweaking is to make sure that the vehicle is semi neutral in four wheel drive mode. When four wheel drive is not engaged, which is typically the majority of the time, one is left with a hopelessly understeery vehicle, because the front still assumes a rear end that has to scrub off excess speed. Anti lock braking, if offered will also be inoperative in four wheel drive mode, just when it is needed the most. It does not take much to see that this is a very sub-optimal implementation compared to all wheel drive systems, which are on the other extreme of being able to dynamically alter the division of power to each axle depending on which end is sliding. The behaviour of a full time or part time auto engaging system is completely predictable and is therefore optimisable to dramatic effect. Average consumers also tend to dismiss the need for good handling. The line "I am not going to race this vehicle" is repeated often enough. However, even if we were to judge vehicles solely as appliances, good handling does enter the equation. A good handling vehicle, such as the many excellent all wheel drive examples mentioned, will hide the difficulty of negotiating a turn, making it seem more effortless. The average driver would then feel more comfortable and confident and will therefore shed less speed entering a curve, leading to less momentum being lost, which in turn means that the vehicle does not have to consume energy reaccelerating back to its original speed. In other words, it would be a more energy efficient appliance. This point is hardly ever raised when discussing the appliance value of vehicles. It is unfortunate that old fashioned part time, manually engaging systems are still being sold on many SUVs today with high prices that are a match for their mediocrity. There is no reason, from a conceptual point of view that these vehicles should not have an all wheel drive system. It is this author's opinion that consumer ignorance and a uncritical media are the main reasons for the slow progress in the truck/SUV market. It is false that a permanently engaged system is incapable of handling the rigours of off-roading as well as the antiquated part time system. The Range Rover has been on the market since 1976 and it has had a full time system with a centre differential since the very first one rolled off the production line. Likewise, the ultimate off roader, the Hummer uses a permanently engaged system with Torsen differentials rather than solidly locked axles and part time manual engagement. Both of these vehicles are held in the highest regard with respect to their off-roading capabilities. The 1999 Jeep Grand Cherokee is significant for being the first mainstream mass market SUV to feature an AWD system that is more advanced than most of its peers. The Grand Cherokee uses hydraulically controlled progressive locking differentials on both front, rear and centre resulting in a system that can deliver all available torque to any one wheel if it is the only one with grip. Unfortunately this highly advanced AWD system is merely an option and consumers who are suspicious and distrustful of technology would end up buying the much cruder 4WD/AWD system which is not necessarily more reliable because of its multitude of selectable drive options. Audi and Subaru continue to successfully market all wheel drive vehicles and both marques actively compete in motorsports to show the worth of their technology. The Audi A4 quattro has been particularly successful in demolishing its two wheel drive competition in seven major touring car series last year despite severe weight handicaps (and is now banned! - Editor). 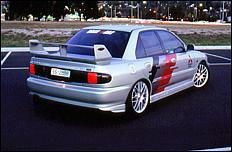 The Subaru Impreza turbo has been extremely successful in World Championship Rallying. The Mitsubishi Eclipse GSX has been less successful in the marketplace, with the vast majority of buyers opting for the front wheel drive version. Die-hard Porsche enthusiasts prefer the rear wheel drive version of the 911 to the all wheel drive version. 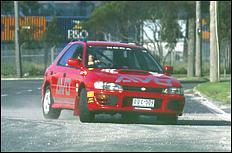 Four wheel drive is increasingly outlawed in competition because they tend to do too well. With the success of sport utility vehicles the market for high performance all wheel drive vehicles will remain tiny. One could only hope that competition among the makers will eventually force all the SUV makers to bring their technology up to all wheel drive levels. This is starting to happen but at a very slow pace. VW recently redesigned the Passat and based it on Audi A4 mechanicals. Since it was using a stretched version of the A4's floorpan, it made economic sense to use Audi's quattro system for the all wheel drive model, rather than to create a unique all wheel drive floorplan using the Syncro system. Thus the "syncro" moniker becomes merely a generic term to distinguish an all wheel drive VW from a two wheel drive variant. This is not the first time that VW has used Audi quattro mechanicals. In the mid 1980's, Americans could buy the VW Quantum Syncro, which not only used the Audi 4000CS quattro's floorpan, but also the trademark inline 5 cylinder engine, mounted longitudinally ahead of the front axle. For the 1999 model year VW has upgraded its AWD system from the viscous coupling based system to a computer controlled clutch developed by the Swedish company Haldex. The advantages include added simplicity since the extra clutch needed for braking can now be eliminated. Also, more precise control of the torque splits and a greater transfer ratio is possible. Derivatives of the AWD fourth generation Golf, (now renamed the "Golf 4Motion") such as the Audi TT and the A3 quattro will use this system. Note that this is still a part time, automatically engaging four wheel drive system. The quattro name, which used to have special significance is now being diluted by marketing expediency. Considerable confusion has arisen from the naming corruption by the two companies. In yet another twist, Subaru has for many years been quietly offering radically different AWD systems in the same car, depending on the transmission choice. The manual transmission Legacies and Imprezas use a full time system that is split 50-50 with viscous couplings for limiting slip. In the automatic transmission versions, however, the system is a part time, computer controlled, automatically engaging system in some models and a full time uneven torque split with computer controlled locking in other models. Mitsubishi has quietly continued to offer its four wheel drive GSX, now with rear limited slip and ABS together in the same package, even though its relatively low sales figures mean that it is far from a profitable model. Advances in ABS technology mean that the coexistence with VC systems is far less troubling than before. Porsches, for example have different ABS specifications depending on whether the model is four wheel drive or two wheel drive. Avoid part time, manually engaging systems, regardless of whether it has manual hubs, auto hubs or any four wheel drive "convenience" features. A limited slip differential on the rear axle is a plus, alternatively 4 wheel traction control is also a big plus. If you need four wheel drive primarily for winter mobility, a set of snow tyres will make a far greater difference to overall control and traction compared to differences between various AWD implementations. If I had to choose I would rather have front wheel drive and snow tyres than four wheel drive and summer tyres. Four wheel drive with the wrong tyres in the snow is an extremely dangerous combination. Author copyright notice: Text copyright © 1997,1999 by Eliot Lim.The text of this article may be distributed freely, provided it is distributed in its entirety.